Hm. I do believe the YA vampire book era has ended, and is now launching into the YA angel era. Angels, angel-bloods, Nephilim, these terms will start becoming familiar just like how fangs, crosses, BLOOD, and stakes became recognizable when novels like Twilight, The Vampire Academy, True Blood, The Vampire Diaries, The Morganville Vampires, etc. came out. 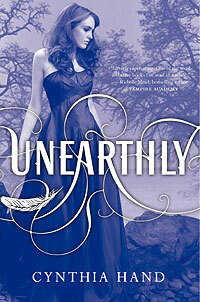 Now, if you want to keep up and dive into the YA fiction of angels now, read Unearthly by Cynthia Hand for starters! As Clara tries to find her way in a world she no longer understands, she encounters unseen dangers and choices she never thought she'd have to make—between honesty and deceit, love and duty, good and evil. When the fire from her vision finally ignites, will Clara be ready to face her destiny? More info about the book here. Oh, and if you’re scared that Unearthly is one of those books that have absolutely no action, do not fear! There is some pretty freaky fighting-between-Earth-and-Hell stuff going on between Clara and these mysterious beings called the Black Wings. What an ominous name, eh?